The climate in Murcia can be defined as almost Mediterranean, in fact it has a particularly remarkable aridity and a very hot summer, and also a good amount of sunshine even in winter. 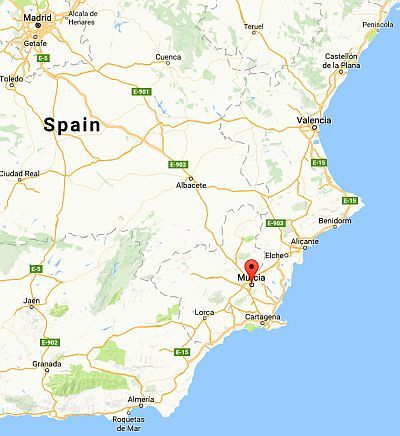 Murcia is the capital of the Autonomous Community of the same name; it is located at sea level, about 35 km (20 mi) away from the coast, in south-eastern Spain. The daily average temperature ranges from 10.5 °C (51 °F) in January to 27.5 °C (81.5 °F) in August. In winter, there are several mild periods, while occasionally there can be cold periods, with highs around 10 °C (50 °F) and light frosts at night. In summer, especially in July and August, the temperature can reach 38/40 °C (100/104 °F). Here are the average temperatures. The rains are scarce, only 300 millimeters (12 inches) per year; in particular, winter is drier than it normally is in Mediterranean climates; in summer it almost never rains. Owing to the scarcity of rainfall, the landscape is arid. Rainy days are particularly rare, although when it rains, sometimes it can rain a lot. In the city, basically it never snows, while sometimes it can snow in the higher areas of the province. The amount of sunshine in Murcia is great in summer, when clear skies prevail; even in winter, however, there are many sunny days. On the coast of the province of Murcia, called Costa Cálida, the temperatures are typical of the Mediterranean coasts, and therefore summer is not as hot as in the capital and in the flat inland areas of the province, although it is more humid (but fortunately with the breeze from the sea), while in winter, very cold temperatures at night are even more rare: typically they only drop to 0 °C (32 °F) in the coldest nights. The rains, however, remain scarce, around 300 millimeters (12 inches) per year, and there's a good amount of sunshine even in winter. Although it is an arid area, on occasion the coast of the province of Murcia may be affected by heavy rains, which can lead to flooding. Along the coast, like in Murcia, it practically never snows. On January 27, 2005, after 60 years, it snowed in Cape Palos, a place more exposed to the north wind than the rest of the coast. Along the coast we find towns such as Cartagena, San Pedro del Pinatar, Santiago de la Ribera, Águilas, Los Alcázares, Mazarrón. 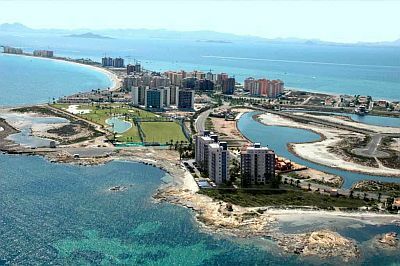 There are tourist resort with golf courses, bays and natural harbors, islands and beaches where you can surf; there is also a large lagoon, called Mar Menor, separated from the sea by a strip of sand (called la Manga); inside the lagoon there are five small islands. In the southern part of the coast, we find the natural park of Sierra de la Muela, Cabo Tiñoso y Roldán. Here, for example, are the average temperatures of San Javier, where they range from 11 °C (52 °F) in January to 25.5 °C (78 °F) in August. In San Javier, only 310 mm (12.2 in) of rain fall per year; here too you can notice the low number of rainy days. Here is the average precipitation. The sea in the Costa Cálida is warm enough for swimming from July to September, when it reaches 23/25 °C (73/77 °F); it remains cool until June. Here, for example, is the temperature of the sea near Cartagena. The best time for a beach holiday in the Costa Cálida is the summer, from June to August. The sea temperature is comfortable enough from July to September, although by September, which overall is still a good month (especially in the first half), the first Atlantic disturbances begin to occur. May and June are sunny months, but the sea is still a bit cool, especially in May, when it is actually a bit cold. 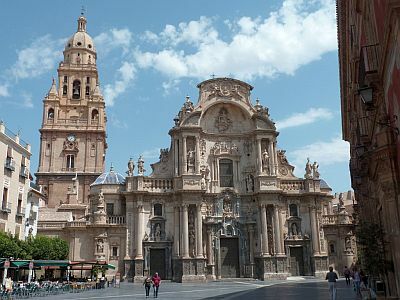 Even though good weather is not always guaranteed, spring and autumn are ideal for visiting the city of Murcia and for excursions to the other cities of the interior (see Lorca), since the summer can be very hot.